Costa Brava means wild coast, but if all you see are the main bays and resorts Brava can seem anything but wild. Unlike the French Riveria where you can practically drive along the cliff top and see the coastline, the Costa Brava is a little more hidden and like many places in this area, you really need to get out of the car to appreciate what it offers. 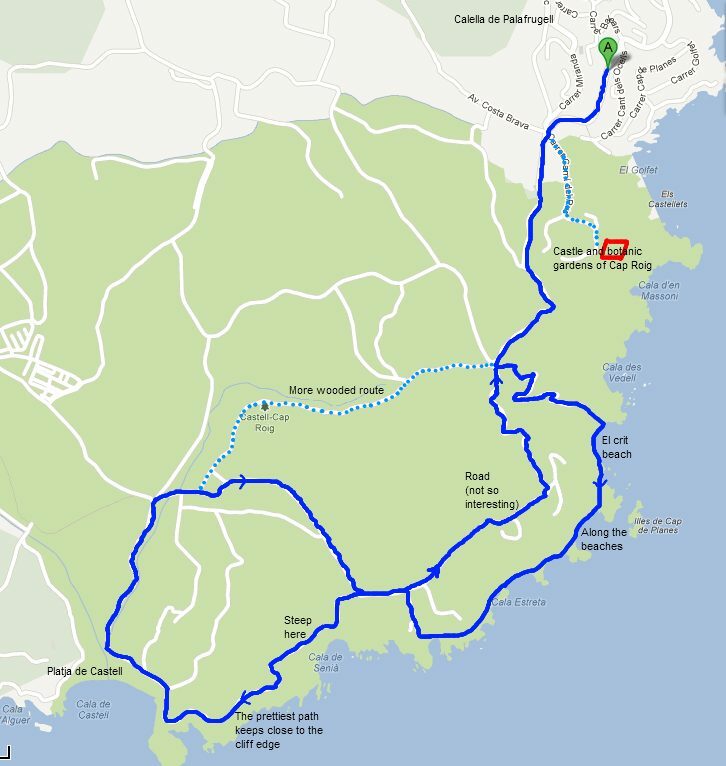 This walk runs from the botanical gardens at Cap Roig above Calella de Palafrugell to the beach at Castell and takes you past some of the classic 'wild' natural unspoilt bays and coves of the Costa Brava. Cap Roig itself is a 'castle' and gardens built from 1927 onwards by a Russian emigre Nicolai Woevodsky and his aristocratic English wife Dorothy Webster just above Calella de Palafrugell. The castle itself was designed as their dream house, but they also established the gardens and bought much of the neighbouring woodland which are now part of the Cap Roig-Castell protected area. Cap Roig Castle itself is situated to the south of Calella de Palafrugell on the cliffs with views to Calella de Palafrugell and Llafranc. At the time the castle was built, Calella de Palafrugell in the 1920s was little more than a small group of houses by Port Bo - the current heart of the village. However, in order to raise money to build the Cap Roig castle, Woevodsky and Webster introduced an number of other wealthy English aristocrats to the area, in some ways helping to establish the first international interest in the Costa Brava. The castle itself and gardens are now owned by a public foundation and the public can now pay to access the botanic gardens (or it's free for La Caixa account holders). 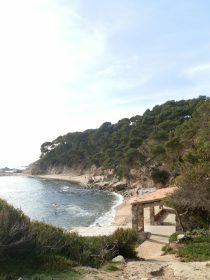 The woodland and natural areas surrounding Cap Roig however are freely open to the public for walking, though car access is normally restricted during the main summer months. If you're interested in music, Cap Roig is the venue for a series of music concerts during the summer and has played host to Sting, Tom Jones, Tony Bennett, Bob Dylan, Kiki Tekawana, Simple Minds, Lady Gaga and a host of other local and world famous artists. Our walk could start by parking the car in the car park at Cap Roig itself, but this time instead we start in Calella and park just above the bay of El Golfet where there is easy parking just off the road (at least outside the high season). A diversion down a flight of stairs will take you down to a viewing point over the pebble beach of El Golfet bay, the last of the four beaches of Calella de Palafrugell. We're keeping to the road though as it snakes up to the upper estates above Golfet. The road splits at the top of the hill just before the farm on the entrance road towards Cap Roig - left to Cap Roig or upwards to the top estate or a signposted track in front of us. This particular crossroads point meets with several paths including those from Ermedas and Mont-ras. It makes it a good starting point if you want to explore the fields and masia farms in the hills and plains away from the coast (also see the Ruta del Tren Petit). We follow the signposted path towards Platja de Castell. At one point we could pass through the Cap Roig car park and reach the path on the other side, but this has been closed off, so the track is the main access to the woods. We walk following the track past the boundary of the Cap Roig estate - in winter some brave car drivers use the path. In summer it is usually closed off to all but the people who live in the scattered houses in the woods. We follow the track as it climbs gently into the woods up to a fiveways point, again with a signpost. To the left we can see two gate posts and a track that winds down the hillside towards the sea. This is the entrance to the Mont-ras bay of El Crit. We follow the path down the cliffs to a clearing at the bottom just above the beach. In principle, people can drive down, but the path is steep and pitted and we've seen cars that have become trapped at the bottom. unable to make it back up the slope. From the clearing above the beach there is a set of steps and small wooden bridges lead down to the bay. In the bay is a small fisherman's hut/refuge and when we were there we were surprised by the number of families and nordic walkers - normally it's quite quiet, but from time to time the Montrasians make family trips to the beach. El Crit itself is a sandy beach under the cliffs, but with a rocky bay and just off the bay are some small islands. It's excellent for snorkelling, though for swimming in the bay, some swimming shoes or flippers are recommended to protect your feet. To the right is a wall of rock, but with a hole in the middle. We go through the hole to the next bay, this time stonier. 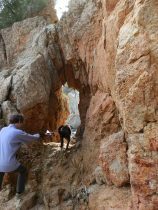 Ahead of us is a stairway up the cliff, but the bottom has been washed away, so to reach it we have to scramble up the rocks at the bottom. After this scramble the path is well laid and easy to follow. We go over the headland and then come down at to another fishing hut which marks the start of a series of sandy bays. These bays are isolated and natural and attract naturists in the summer. Even in January someone was sunbathing naked on one of the bays. 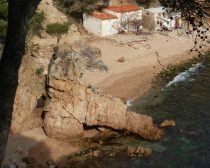 The path then follows the beaches for as long as you can along Cala Estreta ('narrow bay') and round three or four small sandy thin beaches. 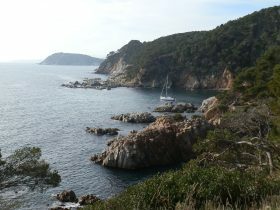 Eventually the path leaves the beaches and climbs into the next headland and then above Cala Corbs. In the bay beneath us we were lucky enough to see cormorants playing in the shallows of the beach. The path then passes through a car park to meet the track at the back. The footpath climbs to the left up and over the top of the next cliff. It's steep and relatively close to the cliff's edge. 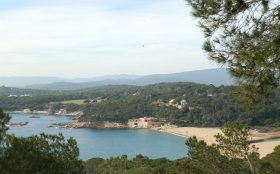 Climb all the way to the top and you are greeted with a view over the ruins of the Iberic village and ahead of you Castel, La Fosca and Palamos. We descend through the woods to Castell beach and then follow the road past the car park and back. Our aim was to take the wood route back via the view point at Roques d'Ase but we didn't take the first left which we should have and instead continued past the abandoned Mas Canyet and along the track that connects the houses above the bays. The track is OK, but we would have preferred walking the wooded path back. Hi. This sounds like a sweet little adventure. Could you please advise what was the length of your route? It's about 4-5km one way. We'd walk it in around 2-3 hours, but there are a lot of opportunities to dawdle along the way.